During the Monday 12PM ET hour of live coverage on MSNBC, anchor Contessa Brewer described the "firestorm" over a newly passed immigration law in Arizona and fretted: "does this lead to a situation where neighbors are turning in neighbors or families turning against families?" Later in the segment, a headline on screen read: "Law Makes it a Crime to be Illegal Immigrant." Brewer discussed the issue with Democratic Congresswoman Loretta Sanchez and wondered: "Is this an effective way to deal with the problem?" In response, Sanchez declared: "to stop people and say, 'I think you look like an illegal immigrant' and then drag them off to jail is not the way to deal with this issue." Brewer followed up by quoting current Homeland Security Secretary and former Arizona Governor Janet Napolitano: "she would veto these kinds of bills because she said - she thought it was important for police to be doing actual police work, that they are not immigration enforcement officers." 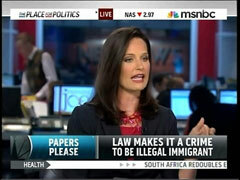 As Brewer made that argument, the headline "Law Makes it a Crime to be Illegal Immigrant" flashed on screen. Brewer later wondered about the political fallout: "It's forcing the President to address immigration policy. It's forcing Republicans and Democrats to wrangle with it. But what really is driving voters and emotion right now are jobs and the economy. Is this a bad issue politically at this time?" Sanchez replied: "I think this is a great issue politically at this time because, for the future in particular, the Hispanic community, which is a big immigrant community and which, of course, has some of the people who are with the least documents, correct documents, it is going to be the political force for the future in this country." CONTESSA BREWER: And a political and legal firestorm brewing over Arizona's tough new immigration law. At least two Latino activist groups and the mayor of Phoenix are planning lawsuits, saying this could lead to racial profiling. Some people are calling it unconstitutional. Among the key provisions in the law, a requirement for police to question anyone they suspect of being an illegal immigrant. And over the weekend, demonstrators staged massive protests against the law. The law also makes it a crime to knowingly conceal, harbor, or shield an illegal immigrant. Essentially, I mean the question is, does this lead to a situation where neighbors are turning in neighbors or families turning against families? California Congresswoman Loretta Sanchez joins me now. Okay, let's take your state, for instance, there is a huge influx of illegal immigrants up and down the coast of California. Is this an effective way to deal with the problem? LORETTA SANCHEZ: No. Absolutely not. First of all, there are a lot of people in the United States that haven't come over a border. They've actually come and they've either overstayed their visa or they haven't been able to renew their work visa, and they're - or they're in limbo, they're waiting. So they're what we call 'out of status.' And there are a lot of people like this. But to go after them, to stop people and say, 'I think you look like an illegal immigrant' and then drag them off to jail is not the way to deal with this issue. The issue we need to do is to deal with it on a national basis. We need to have a good visa program so that we can let workers who need to come to our country, come here and work, and not worry about hiding some place. And we need to fortify our borders in the correct manner, so that we can let the people we want to come in and keep people from coming in that we don't want. CONTESSA BREWER: Janet Napolitano says that she - when she was the governor of Arizona, she would veto these kinds of bills because she said - she thought it was important for police to be doing actual police work, that they are not immigration enforcement officers. SANCHEZ: Absolutely. I mean, there is so much work already at the local level. I mean, think about all the police cuts we've taken, just in this downturn in the economy. The rise of problems with, whether it's rapists, pedophiles, robberies, et cetera. Our local police should be worried about that and the thing that happens, is if a community that is an immigrant community, whether legal or not, thinks that its police force, it's local police force is going to come and drag its people away, they will stop cooperating with police in bringing out the criminals. BREWER: I should mention the Arizona law makes a provision there and says that if law enforcement think that questioning someone about their immigration status would interfere with an investigation, well then, in that case, they don't have to do it. One more question, let me talk about the politics of this. It's forcing the President to address immigration policy. It's forcing Republicans and Democrats to wrangle with it. But what really is driving voters and emotion right now are jobs and the economy. Is this a bad issue politically at this time? SANCHEZ: I think this is a great issue politically at this time because, for the future in particular, the Hispanic community, which is a big immigrant community and which, of course, has some of the people who are with the least documents, correct documents, it is going to be the political force for the future in this country. One out of every four Americans is now of Hispanic decent, and soon it will be even a larger population, and we make the difference. Especially in places like Arizona, so I think that to move in a good direction with respect to immigration reform is actually better for this country. BREWER: Congresswoman Sanchez, it's always a pleasure when you come on. I appreciate your time. SANCHEZ: Thank you so much, Contessa. Thank you.